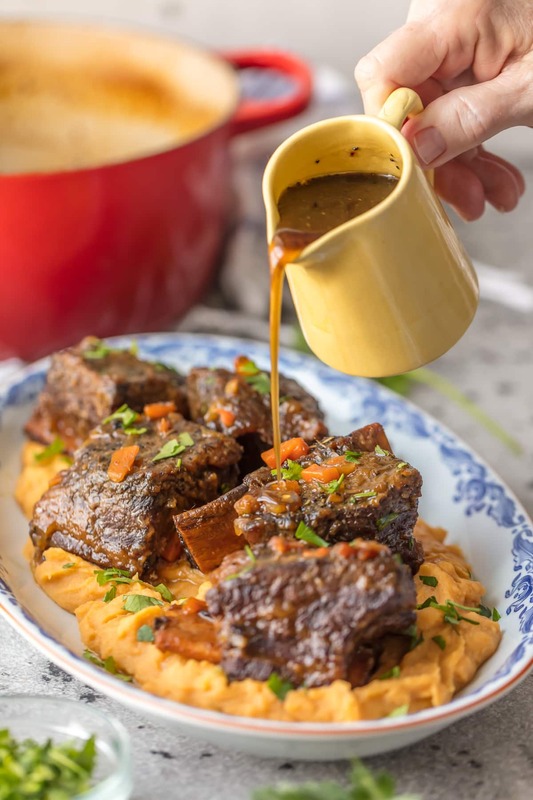 We love these DUTCH OVEN HONEY BOURBON SHORT RIBS! It’s so easy to make these flavorful and fall off the bone ribs right in your dutch oven. Less cleanup and more flavor! YOU GUYS. 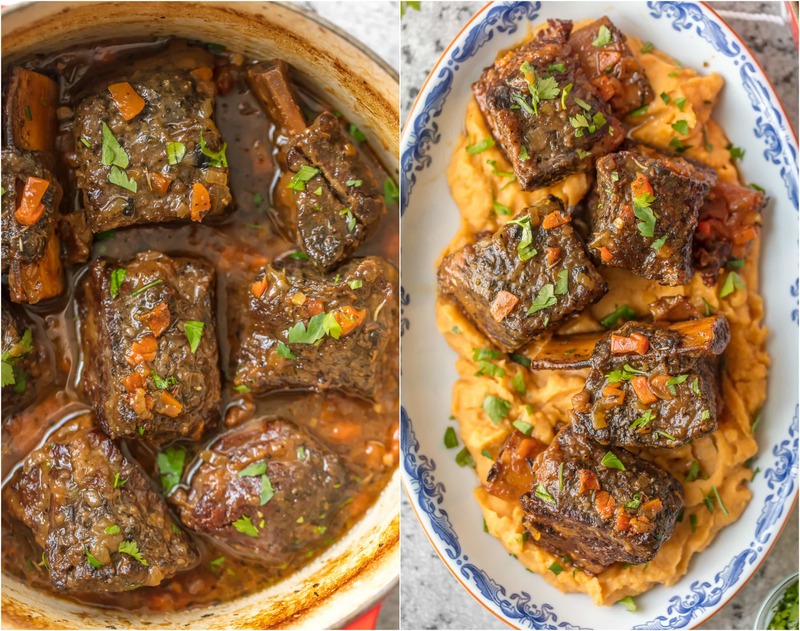 Mom and I actually made these AMAZING and unbelievably yummy Dutch Oven Honey Bourbon Short Ribs and photographed them when I was 9 months pregnant with Henry, way back in late February of last year!! My intention was to have it go out to you all during my relaxing time at home when he was a newborn (insert wide eyed emoji) and somehow (how? lol) I totally forgot and it has sat in my drafts folder for over 6 months. TRAVESTY! Summer came and went and since this is more of a cool weather recipe anyway, I felt like I needed to push it out to the world. 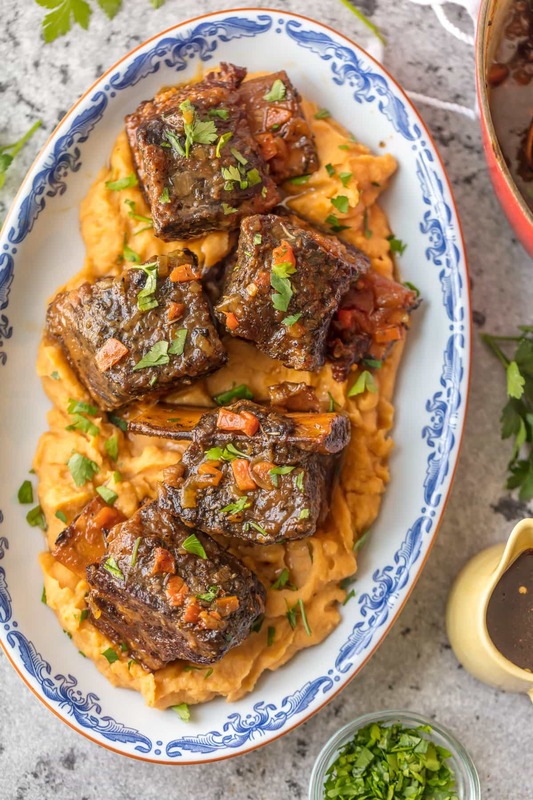 These short ribs and baby Henry…my two contributions to the world. 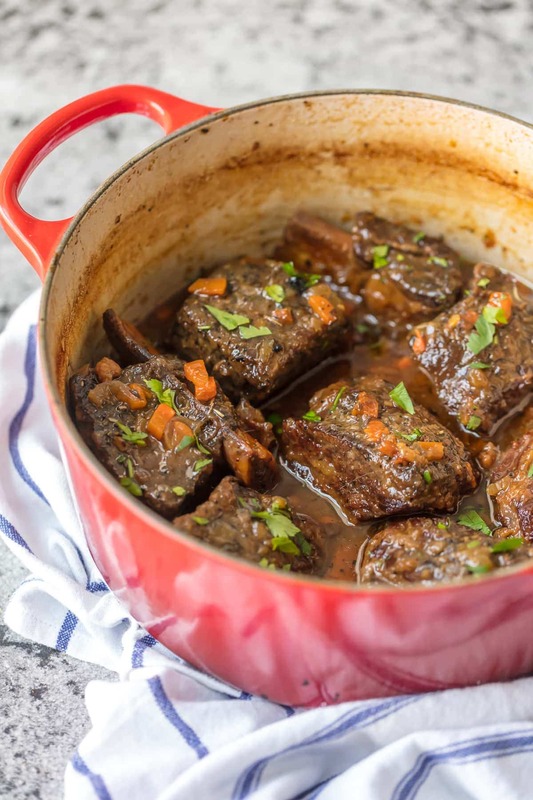 🙂 I wanted to make sure you saw these because they’re fall off the bone tender, full of flavor, and made in your dutch oven which is SO convenient. Yum yum YUM! 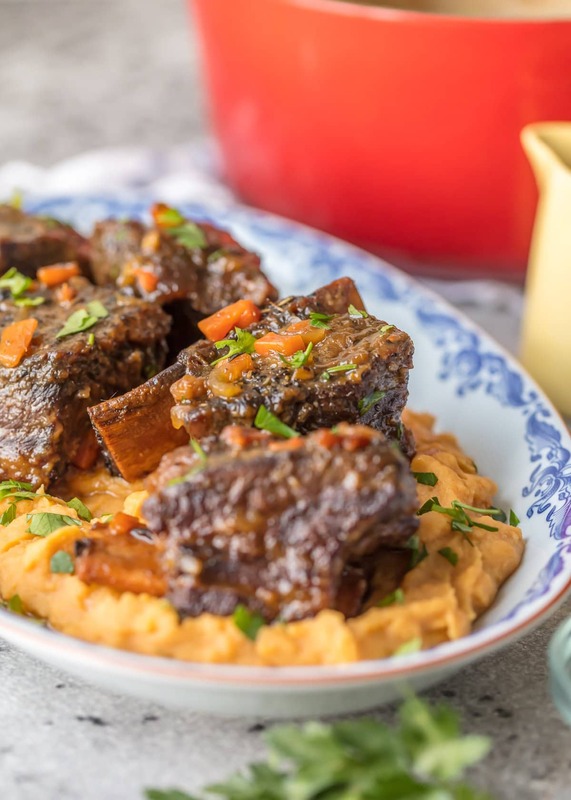 We served these Honey Bourbon Short Ribs over mashed sweet potatoes and WOW were they amazing. My 9 month pregnant self LOVED THEM SO MUCH. I’m going to have to make them again asap because looking at these pictures all this time later has me drooling and remembering. This is such a great comfort food recipe sure to please as the weather gets cooler and cooler. Don’t you just want to pull up a set in front of a fire and dig in?! Let me tell you something. That Honey Bourbon glaze is the stuff dreams are made of. Don’t fix this meal for a first date because manners go out the window when honey bourbon glaze is involved. Aren’t these babies beautiful? Not as beautiful as the real baby I created last Spring, but I’m pretty proud of these short ribs as well. Liberally salt & pepper all sides of the short ribs and dredge lightly in flour. Set aside. In a large Dutch oven, cook bacon until crispy. Transfer crispy bacon to a paper towel-lined plate. Once cooled, transfer to a refrigerator container to save for later use. If more fat is needed to sauté the carrots, onion and garlic, add 2 tablespoons olive oil to the bacon grease. Add the carrots and cook them for 2 minutes. Add the onions and cook until onions are translucent. Add the garlic and cook 30 seconds. Transfer vegetables to a large heatproof bowl and set aside. 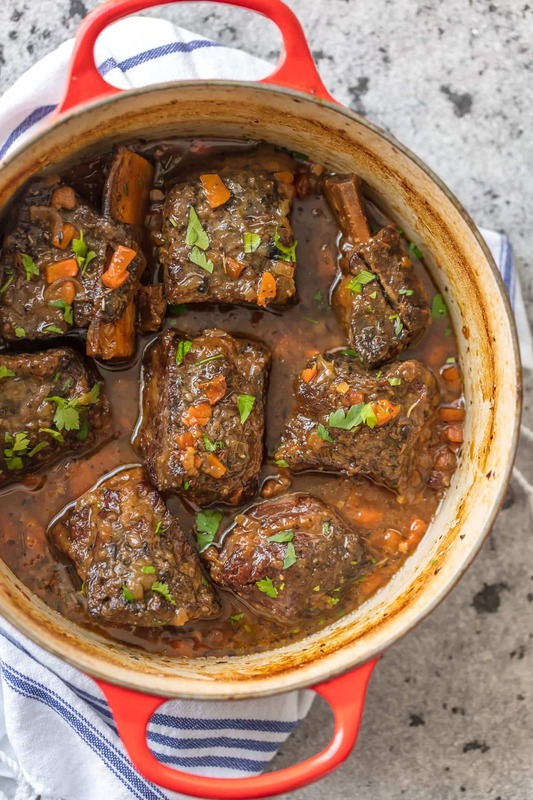 Turn heat to HIGH and place short ribs in the Dutch oven. Turn until all sides have browned, about 1 minute per side. 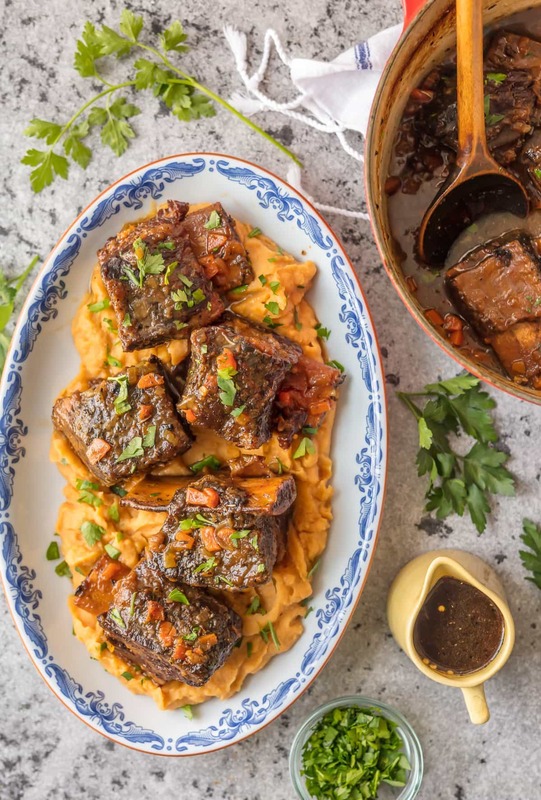 Transfer short ribs to the bowl with the vegetables. Turn heat to MEDIUM. Pour in the Honey bourbon and scrape, or deglaze, the pan to release all the bits of flavor stuck on the bottom of the pan. Add the honey, chicken stock, Worcestershire Sauce & herbs. Taste the broth and season with more salt & pepper, if needed. Place the lid on the pot and set in on the middle rack in the oven. Cook 2 hours at 350 degrees F, then reduce heat to 325. Cook an additional 30-45 minutes or until meat is falling off the bones and is fork-tender. Remove the pan from the oven and allow it to rest, lid on, for 20-30 minutes. Before serving, skim the fat off the top of the liquid. Serve with mashed potatoes or creamy polenta and drizzle with the Honey Bourbon Glaze. Combine all glaze ingredients in a small saucepan. Bring to a boil over medium-high heat, then reduce heat to medium-low. Simmer (or low boil) 5 minutes or until mixture is reduced and is similar to syrup. The sauce will thicken as it cools. If it becomes too thick, add a little water, whisk and reheat to desired thickness.